Spainyie, Inglis an 62 indigenous linguistic groups o Amerindian leids. Mexicans (Spaingie: Mexicanos) refers tae aw bodies frae Mexico, a multiethnic kintra in North Americae, an/or that identifee wi the Mexican cultural an/or naitional identity. Mexico becam a naition in 1821 whan Mexico achievit unthirldom frae the Spainyie Empire; this begoud the process o forgin a Mexican naitional identity that fusit the cultural traits o indigenous pre-Columbian oreegin wi thae o European, pairticularly Iberie, ancestry. This led tae whit haes been termit "a peculiar form o multi-ethnic naitionalism". The maist spoken leid bi Mexicans is Mexican Spainyie, but mony speak leids frae 62 unalike indigenous linguistic groups an ither leids brocht tae Mexico bi recent immigration or learnt bi Mexican immigrants bidin in ither naitions. Ower 78% o the Mexican fowk bide in Mexico but thare is a sizable diaspora wi naurly 22% bidin in the Unitit States. The Mexican fowk hae variet oreegins an an identity that haes evolvit wi the succession o conquests amang Amerindian groups an bi Europeans. The aurie that is nou modren-day Mexico haes cradled mony predecessor ceevilizations, going back as far as the Olmec which influencit the latter ceevilizations o Teotihuacan (200 B.C. tae 700 A.D.) an the hintle debatit Toltec fowk who flourished aroond the 10t an 12t centuries A.D., an endin wi the last great indigenous ceevilization afore the Spainyie Conquest, the Aztecs (13 Mairch 1325 tae 13 August 1521). The Nahuatl leid wis a common tongue in the region o modren Central Mexico durin the Aztec Empire, but efter the arrival o Europeans the common leid o the region became Spainyie. Efter the conquest o the Aztec empire, the Spainyie re-admeenistered the laund an expandit their awn empire ayont the umwhile boondaries o the Aztec, addin mair territory tae the Mexican sphere o influence which remained unner the Spainyie Croun for 300 years. Cultural diffusion an intermixin amang the Amerindian populations wi the European creatit the modren Mexican identity which is a mixtur o regional indigenous an European culturs that evolvit intae a naitional cultur durin the Spainyie Colonial period. This new identity wis defined as "Mexican" shortly efter the Mexican War o Unthirldom an wis mair invigoratit an developit efter the Mexican Revolution whan the Constitution o 1917 offeecially establisht Mexico as an indivisible pluricultural naition foondit on its indigenous ruits. Totonac face with a smile and closed eyes. Human races in New Spain and Mestizo baby in Diego Rivera's picture. The Maist indigenous state wis Oaxaca wi 675,119 bodies oot o 976,005 inhabitants wur classifee'd as indígena. This meant that 69.17% o Oaxaca's population haed a pur indigenous identity. This wis the last Mexican Census which asked fowk sel-identifee thairsels wi a racial group. Ethnic relations in modern Mexico hae grown oot o the historical context o the arrival o Europeans, the subsequent colonial period o cultural an genetic miscegenation athin the frame wirk o the castas seestem, the revolutionar periods focus on incorporatin aw ethnic an racial group intae a common Mexican naitional identity an the indigenous revival o the late 20t century. The resultin pictur haes been cried ""a peculiar form o multi-ethnic naitionalism". Vera generally speakin ethnic relations can be arrangit on an axis atween the twa extremes o European an Amerindian cultural heritage, this is a remnant o the colonial Spainyie caste seestem which categorisit individuals accordin tae their perceivit level o biological mixtur atween the twa groups. Addeetionally the presence o considerable portions o the population wi pairtly African an Asie heritage further complicates the situation. Even tho it still arranges bodies alang the line atween indigenous an European, in practice the classificatory seestem is nae langer biologically based, but rather mixes socio-cultural traits wi phenoteepical traits, an classification is lairgely fluid, allouin individuals tae muive atween categories an define their ethnic an racial identities situationally. The lairge majority o Mexicans can be considered as "Mestizos", meanin that they neither identifee fully wi ony indigenous cultur or wi a pairticular nan-Mexican heritage, but rather identifee as haein cultural traits an heritage that is mixed bi elements frae indigenous an European traditions. Bi the deliberate efforts o post-revolutionar govrenments the "Mestizo identity" wis constructit as the base o the modren Mexican naitional identity, throu a process o cultural synthesis referred tae as mestizaje. Mexican politeecians an reformers such as José Vasconcelos an Manuel Gamio wur instrumental in biggin a Mexican naitional identity on the concept o mestizaje. The category o "indigena" (indigenous) can be defined narraely accordin tae linguistic criteria includin anerlie bodies that speak ane o Mexico's 62 indigenous leids, this is the categorisation uised bi the Naitional Mexican Institute o Statistics. It can be defined broadly tae include aw bodies who selidentifee as haein an indigenous cultural backgrund an aw, whether or no they speak the leid o the indigenous group they identifee wi. This means that the percentage o the Mexican population defined as "indigenous" varies accordin tae the definition appleed, cultural activists hae referred tae the uisage o the narrae definition o the term for census purposes as "statistical genocide". The term "Mestizo" is no in wide uise in Mexican society the day an haes been droppit as a category in population censuses, it is housomeivver still uised in social an culural studies whan referrin tae the nan-indigenous pairt o the Mexican population. The wird haes somewha pejorative connotations an maist o the Mexican citizens who wad be defined as mestizos in the sociological leeteratur wad probably sel-identifee primarily as Mexicans. In the Yucatán peninsulae the wird Mestizo is even uised aboot Maya speakin populations livin in tradeetional commonties, acause durin the caste war o the late 19t century those Maya who did no join the rebellion wur classifee'd as mestizos. In Chiapas the wird "Ladino" is uised insteid o mestizo. Sometimes, pairticularly ootside o Mexico, the wird "mestizo" is uised wi the meanin o a body wi mixed Indigenous an European blood. This uisage does no conform tae the Mexican social reality whaur a body o maistly indigenous genetic heritage wad be considered Mestizo either bi rejectin his indigenous cultur or bi no speakin an indigenous leid, an a body wi a vera law percentage o indigenous genetic heritage wad be considered fully indigenous either bi speakin an indigenous leid or bi identifyin wi a pairticular indigenous cultural heritage. Mexicans are linguistically diverse, wi mony speakin European leids as well as various Indigenous Mexican leids. Spainyie is spoken bi approximately 92.17% o Mexicans as their first leid makkin thaim the lairgest Spainyie speakin group in the warld follaeed bi Colombie (45,273,925), Spain (41,063,259) an Argentinae (40,134,425). Awtho the great majority speak Spainyie de facto the seicont maist populous leid amang Mexicans is English due tae the regional proximity o the Unitit States which caws for a bilingual relationship in order tae conduct business an trade as well as the migration o Mexicans intae that kintra who adopt it as a seicont leid. Mexican Spainyie is distinct in dialect, tone an syntax tae the Peninsular Spainyie spoken in Spain. It contains a lairge amoont o loan wirds frae indigenous leids, maistly frae the Nahuatl leid such as: "chocolate", "tomate", "mezquite", "chile", an "coyote". Mexico haes nae offeecial de jure leid, but as o 2003 it recognises 62 indigenous Amerindian leids as "naitional leids" alang wi Spainyie which are protectit unner Mexican Naitional law givin indigenous fowks the entitlement tae request public services an documents in their native leids. The law includes ither Amerindian leids regardless o oreegin an aw, that is, it includes the Amerindian leids o ither ethnic groups that are nan-native tae the Mexican naitional territory. As such, Mexico's Naitional Commission for the Development o Indigenous Fowks recognises the leid o the Kickapoo who immigratit frae the Unitit States, an recognises the leids o Guatemalan Amerindian refugees. The maist numerous indigenous leid spoken bi Mexicans is Nahuatl which is spoken bi 1.7% o the population in Mexico ower the age o 5. Approximately 6,044,547 Mexicans (5.4%) speak an indigenous leid accordin tae the 2000 Census in Mexico. Thare are Mexicans livin abroad which speak indigenous leids maistly in the Unitit States an aw but their nummer is unkent. ↑ "B03001. HISPANIC OR LATINO ORIGIN BY SPECIFIC ORIGIN". Factfinder.census.gov. Retrieved 2010-10-28. ↑ "statcan.ca; Mexicanos en Canadá Censo de 2001". 2.statcan.ca. Retrieved 2010-10-28. ↑ "Mexicanos en España INE 2007". Ine.es. 2001-05-28. Retrieved 2010-10-28. ↑ "Investigación de la Migración Internacional en Latinoamérica (IMILA)". Eclac.cl. Retrieved 2010-10-28. ↑ "Statische Bundesamt Deutschland". Retrieved 2010-10-28. ↑ "Argentina - Población extrenjera residente en Argentina de 2000–2008". Pagina12.com.ar. Retrieved 2010-10-28. ↑ "ime.gob.mx; Mexicanos en Reino Unido". Ime.gob.mx. Retrieved 2010-10-28. ↑ "INED France- INED". Retrieved 2010-10-28. ↑ "PERIOD OF IMMIGRATION, COUNTRY OF BIRTH AND LAST COUNTRY OF RESIDENCE IN ISRAEL 2008" (PDF). .cbs.gov.il. Retrieved 2010-10-28. ↑ "Istat". Demo.istat.it. Retrieved 2010-10-28. ↑ "INE". INE. Retrieved 2010-10-28. ↑ "2000 Housing and Population Census". Celade.cepal.org. Retrieved 2010-10-28. ↑ "Colombia - Sistema de Consulta Información Censal (Censo 2005)". 190.25.231.242. Retrieved 2010-10-28. ↑ Servicios de Impacto USA (2010-04-22). "DEMOGRAFIA: Los hispanos de origen Mexicano por todo el mundo". Impactousa.com. Retrieved 2010-10-28. ↑ Tony Nick Frudakis (2008). Molecular photofitting: predicting ancestry and phenotype using DNA. Elsevier. p. 348. ISBN 978-0-12-088492-6. 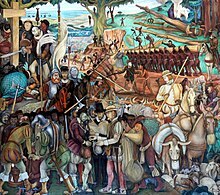 ↑ Bartolomé (1996:2)"En primer lugar cabe destacar que en México la pertenencia racial no es un indicador relevante ni suficiente para denotar una adscripción étnica específica. El proceso de mestizaje no ha sido sólo biológico sino básicamente social y cultural, por ello personas racialmente indígenas pueden asumirse y definirse culturalmente como mestizas. De esta manera ser o no ser indígena representa un acto de afirmación o de negación lingüística y cultural, que excluye la pertenencia a un fenotipo racial particular. Por lo tanto es relativamente factible realizar el llamado tránsito étnico, es decir que un indígena puede llegar a incorporarse al sector mestizo a través de la renuncia a su cultura tradicional y si sus condiciones materiales se lo permiten. Este acto supone tanto la aceptación de un estilo de vida alterno como la negación del propio, incluyendo la no enseñanza de la lengua a sus hijos. Pero muy difícilmente ocurre lo contrario; esto es que individuos fenotípicamente "blancos", pretendan reivindicar una adscripción indígena. Sin embargo, y con gran frecuencia, esas mismas personas considerarán a los indígenas como sus antepasados, fundadores de una "nación mexicana" que ahora les pertenece en calidad de herederos." ↑ Encyclopædia Britannica. "Spanish language - Britannica Online Encyclopedia". Britannica.com. Retrieved 2010-07-26. ↑ "www.ine.es Spanish population 2009" (PDF). Retrieved 2010-10-28. ↑ "Spanish Language History and Main Spanish-Speaking Countries". Todaytranslations.com. Retrieved 2010-07-26. ↑ "Constitución Política De Los Estados Unidos Mexicanos" (PDF). Retrieved 2010-07-26. ↑ "Microsoft Word - 257" (PDF). Retrieved 2010-07-26. ↑ "Kikapúes — Kikaapoa". CDI México. Retrieved 2007-10-02. ↑ "Aguacatecos, cakchiqueles, ixiles, kekchíes, tecos y quichés". CDI México. Retrieved 2007-10-02. ↑ "Perfil sociodemográfico de la población hablante de náhuatl" (PDF). Retrieved 2010-07-26. ↑ "Can a Mother Lose Her Child Because She Doesn't Speak English?". Time. August 27, 2009. Retrieved May 12, 2010. This page wis last eeditit on 18 November 2018, at 02:25.